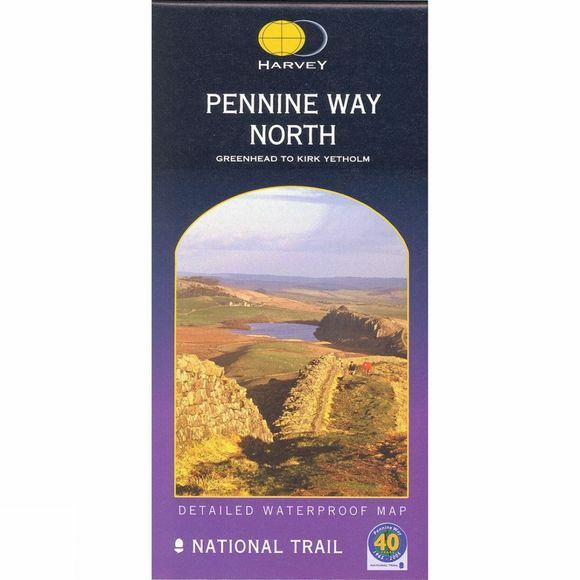 The Pennine Way was Britain's first National Trail, opened in 1965. It follows the backbone of England from the Peak District to the Scottish borders. Pennine Way North covers the route from Greenhead to Kirk Yetholm. It is one of the toughest UK long distance footpaths, and forms part of the European Footpath Network. Just 3 Harvey maps cover the whole 268-mile route. Each covers a section of the Way suitable for a comfortable week of walking. Each starts and finishes near public transport, so no hassle with getting lifts. Each also contains lots of information and useful telephone numbers to assist the walker with planning. As well as information on finding accommodation, camping, food. Directions to the start. Also Ranger Service contact numbers and enlargements of towns/villages showing facilities available and tips on weather and clothing. Detailed mapping, full legend. National Grid – can be used with GPS. 1:40,000 scale. Waterproof. Supplied in clear plastic pocket.